It was one of those rare situations back in the 1970’s, for us, that day luck was on our side. After walking behind some apartments, probing three holes, we needed permission to dig them. Elmer and I knocked on one of the rear doors and asked permission to dig. The occupant didn’t speak English but said yes anyway. It was obvious this was not the owner so we knew we could get kicked out at anytime. Even though we had “permission” we decided to park down the alley just in case there were any problems. We picked what we thought was the best hole to dig first and starting digging at a pretty fast rate. Elmer was the strongest so he did most of the digging. As he got close to the bottom out came the first bottle of the hole, an eye opening apricot puce E. Wideman/ J. Chappaz! Before I started to take it to the car out came a second. I went to put then in the car and when I came back, there was third one lying there next to the hole and soon a fourth one was pulled out. Again I made a trip to the car only to find the fifth and sixth one sitting there next to the hole when I came back. Time to take another trip to the car! I came back to a hole that was almost done when out came the seventh one. I waited as Elmer started to work on another. Ironically out of the bottom came the only green one. This was icing on the cake. Another trip to the car. Within minutes I came back and was leaning over the hole looking down watching Elmer scraping the last part of the bottom. Soon I heard footsteps coming from behind me. The sound of jingling change in the pockets told me it was someone wearing slacks. I froze and as the person stopped behind me he said, “Hello, what are you doing?” I acted like I was doing nothing wrong, turned to answer him, said “Oh, Hi! We were just digging for old bottles.” and I turned my head down again, like nothing was wrong. As it turned out, he said he owned the property, asked for our names, where we lived, and where our car was. We gave him fake names and said we had no ID. We told him we were from out of town but we didn’t have a car. He could tell we weren’t being honest and told us to fill the hole. He walked quickly straight into the building; probably to call the police. I can tell you that was the fastest I have ever seen a hole filled! We were out of there in about 3 minutes. We knew quite a bit about bottles but these we had only seen broken and another we had dug earlier in the year. Not knowing anything about the Wideman/Chappaz bottles, we proceeded to go to the Marysville Library. We started the task of looking over years of microfilm of the local newspaper. Finally, we came across an ad that said “E. Wideman, Wholesale Liquor Dealers, corner of 3rd and B St. Marysville”. 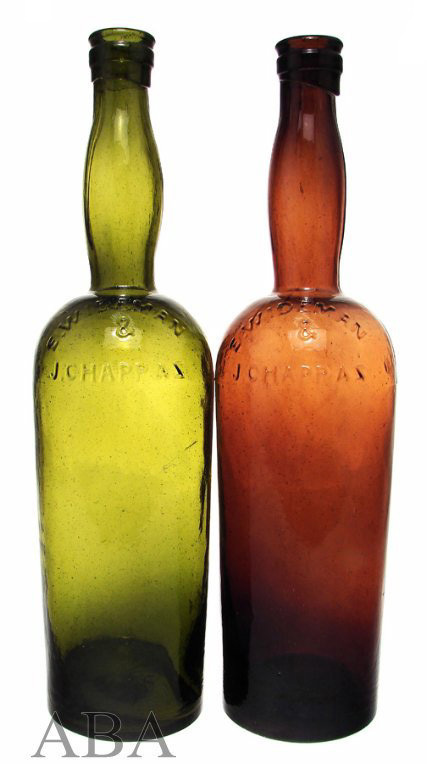 Imagine the feeling when we found out we dug these beautiful bottles next door to the E. Wideman Wholesale Liquor Warehouse! This was great news but still no mention of J. Chappaz. Now we were pretty sure they were from Marysville but what did they contain? 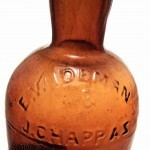 After spending more time we found another advertisement saying E. Wideman proprietor of Alpine Stomach Bitters, but again no mention of J. Chappaz. Could it be these bottles were a bitters? Finally we found an ad confirming our hopes; an ad with J. Chappaz, E. Widemann, and Alpine Stomach Bitters–all together. We felt like detectives who had just solved a case! I kept the green one and the best of the apricot example. Years later, I sold both through American Bottle Auctions via Jeff Wichmann, an old friend from the beginning of my interest in digging and collecting old bottles. Not bad for one outhouse! I cannot help but notice the phrase, Marty has not spoken to him since. A lot of these beautiful old RARE specimens have caused a lot of hard feelings over the years, and it is a sad fact of our hobby, I have known of several occasions of hard feelings over splits of hole diggin, its a shame but it is fact. So what all of us should really appreceiate now is the fact that these oldtime diggers of the sixties seventies and even eighties dug up all these great bottles for us to drool over and use the goldn pick method of aquiring same. Picking motorhomes rrs definitely an high-priced preference complicated plenty supposed. the food in an heater, might conduct washing clothes . a new halogen cooker. Individuals purchased this specific toy quantity it then 4 out of 5 celestial bodies. Excellent line of one of the best dining establishment buyers fit in an average class of "imaginative"
when it concerns his open-minded attitude to replace and simply adaptation in the sector.